A flexible circuit board with stiffener design is classified by IPC as a type 1, 2, or 3, depending upon the layer count, and is defined as a one or more circuit layer flex circuit with stiffener. The stiffener is not part of the electrical interconnect of the design, with a few minor exceptions defined later in this article, and performs a mechanical function only. Rigid-flex circuit board designs are classified as IPC type 4 and defined as a multilayer rigid and flexible material combination containing two or more layers with plated component and or via holes. 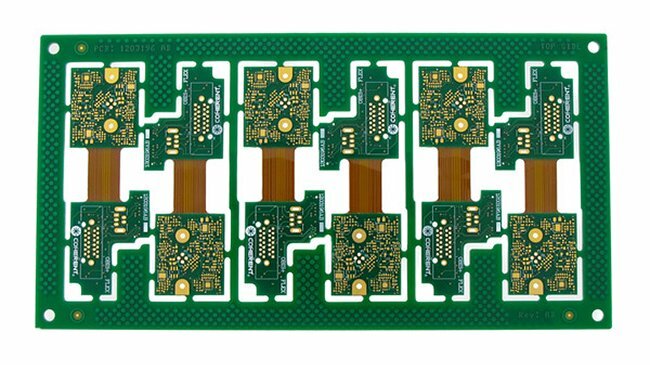 The integration of flex layers within a rigid PCB construction allows multiple rigid areas to be interconnected together without any additional connectors or wiring. Stiffeners are most commonly manufactured from either FR4 or polyimide. FR4 is cost effective and typically used to support component areas, due to its higher rigidity than polyimide. Thicknesses vary from 0.008” to 0.059” or greater. 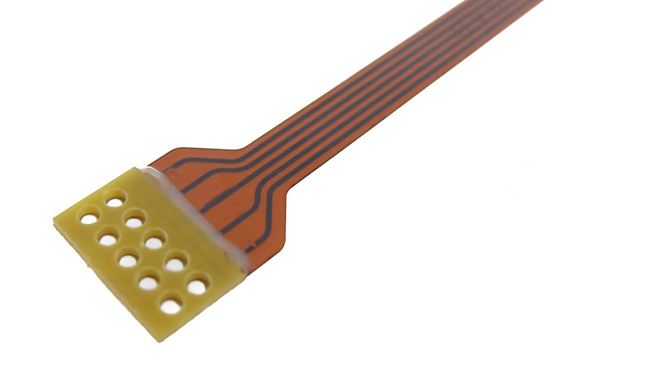 Polyimide is used for increasing the thickness at, and providing support for, ZIF connector contact fingers. It allows for the tight tolerance of the flex thickness and part outline at the contacts as called out by the connector specifications. Typically, at the finger area, flex thickness tolerance is +/- 0.002” and outline width is +/- 0.003”. Polyimide is also used to limit bend capabilities in specific areas to facilitate installation in the final assembly, reinforce mounting hole locations and provide added wear resistance if there is an abrasion concern. Stiffeners can also be manufactured from aluminum or stainless steel as well as other materials. Aluminum is commonly used for designs that require heat dissipation. Stainless steel is used when the design has space limitations on the stiffener thickness and a higher level of support is required than what an FR4 stiffener of the same thickness can provide. Both materials are added cost factors, can extend delivery times, and may have minimum order quantity requirements. Rigid-flex circuit boards utilize the same materials as rigid PCBs and flex circuits but differ in the type of pre-preg used. The pre-preg required has a reduced flow capability and is referred to as either “no-flow” or “low- flow”. It is the same material as standard full flow pre-preg but is cured to a higher level prior to use in lamination. This increased cure state prevents the pre-preg from being extruded out between layers and onto the surface of the interconnecting flex sections. If allowed to occur, this would violate IPC-6013 specifications and result in a finished part that is non-functional or that is easily broken when bent. The necessary low-flow format of the pre-preg is not available in all types of rigid materials. 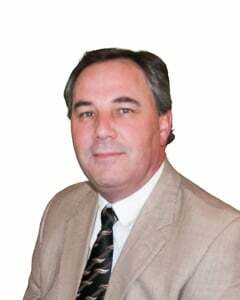 It’s reduced flow characteristics also require a thicker amount to ensure a proper lamination. Attached with either thermo setting flex adhesive or pressure sensitive adhesive (PSA), ZIF connector applications require thermo set adhesive.